1. It's a Pity to Say Goodnight! 10. How Can I Tell Her? This newest album by Digby's Half-Dozen brillantly illustrates all the facets of the group that caused their first to be hailed by 'The Observer' in l998 as "relaxed, witty, amazingly accomplished. There cannot be another band with quite this range, from Dixieland via bebop to R'n'B'". Of this triumphant follow-up the 'Penguin Guide to Jazz on CD' commented "the Fairweather band sounds more alert and adventurous than ever! There are eighteen tracks here and every one is sharply crafted and dispatched. Digby's phrasing is exquisite!". "Things ain't what they used to be" was voted one of his five 'Records of the Year' by Eddie Cook, Editor-in-Chief of 'Jazz Journal International' and 'Record of the Year' by pianist-critic Hugh Ledigo in 'Jazz Rag'. 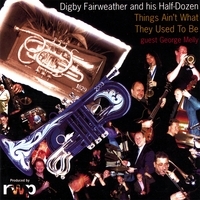 It remains the perfect illustration of the Half Dozen's crafts; from sophisticated Dixieland to bebop and beyond, eclectic repertoire (from Spencer Williams to Chris Montez), virtuoso soloing from all the members and the close-harmony vocals (a la Four Freshmen) of the 'Four Fairweather Friends'.